When in Mr. Woodruff´s band classes, many students noticed than random items just randomly fall, even when they are perfectly balanced on top of a table. Mr. Woodruff may be controlling gravity to specifically make these jokes. Is it all coming together now? We thought so. Many students love the infamous beginning band song called “Hot Cross Buns.” However, Mr. Woodruff seems to encourage playing this song a little bit too much. Even for his advanced bands. This would mean all of the songs that are in that book would be written by none other than himself. That means “Hot Cross Buns,” “Montego Bay,” “Rockin Rondeau,” and “Regal March” would all be written by Mr. Woodruff. I think by now we are all quaking. We all know the infamous K-Pop band titled ¨BTS.¨ However, what if someone we all know was featured in this band? Mr. Woodruff is always seen waltzing around the room and listening to music. Although we aren’t sure what this music is, we can all assume it is likely K-Pop. I mean, after all, BTS has sold millions of albums worldwide. This is where it gets darker. What if Mr. Woodruff is part of BTS? We have come to believe that he is the lead singer in BTS. We do have evidence for this, of course. During block days in band, Mr. Woodruff seems to always play some sort of Korean band video. This may be him telling us that he is part of one, BTS. This is absolutely the only explanation. Mr. Woodruff must be wearing a mask to hide his true self. That bald head may tell a lot bigger story. Did Mr. Woodruff Cause Hurricane Katrina? We all remember the devastating hurricane that affected Florida and Louisiana many years ago. However, what if Mr. Woodruff caused the traumatizing hurricane? If you are a band kid, you may remember that a few weeks ago the band room had a flood where the instruments were stored. Mr. Woodruff says that ¨a pipe broke in that room.¨ However, kids aren’t buying that story. What if with a simple sneeze, Mr. Woodruff caused a hurricane that flooded the entirety of the band room. Mr. Woodruff could very well be a walking hurricane. I believe that we can all agree that these conspiracy theories are clearly the only reasonable explanation. Are they finally catching up to your senses? Is your mind blown? Are you quaking? Let us know in the comments below! Also, be sure to fill out the poll to vote on which teacher you want us to write conspiracy theories about next time (votes are due Wednesday night at 8:00pm). Until then, have a great day, Cougars! I was shocked to see that Mr. Woodruff caused Hurricane Katrina. However, I knew it all along, it all makes sense. oh yeah, votes are due Wednesday night at 8:00 pm. yo, we need to make a conspiracy theory on Mr. Mitchell. Do you have the evidence that Mr. Woodruff is a low-key, secret BTS member? If he is, I’ll have to look at my former Band teacher differently. Mr. Woodruff is an old man with children. Unless he lies about the children, he’s probably just Mr. Woodruff. We do, my proof is that he is. Hey Gavin, I just wonder if any of these theories are written as for entertainment or something much more serious? I have heard students talking about them and I’m kinda confused. I wonder how these teachers could react when they know that the students know the truth. Ms. Walters is next! Too bad for h-, I mean, let´s see if there´s anything she´s hiding. 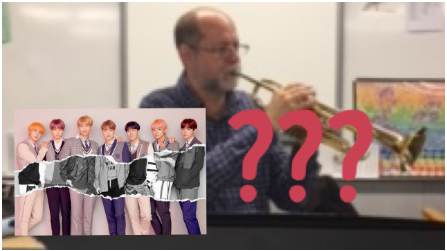 IS MR. WOODRUFF THE 8TH MEMBER OF BTS??????????????????? I’ve gotta say these conspiracy theories are amazing and anyone who denies that is part of the conspiracy theory. Inside source: Mr. Woodruff loves Japanese Pocky sticks! He always has a box in his lunch bag. I think he got reject from Arashi and secretly joined BTS.